The above info came from Kyle Wright, and was edited by yours truly (contact me). The image came from stop2shop.com. 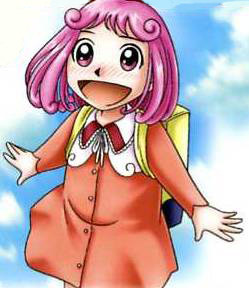 Kolulu was a mamodo forced to fight against her will. She told Zatch something very important that, since then, he would always keep with him for the fight to become the mamodo king. Unfortunately, Kolulu had two sides: a kind, peaceful one, and a destructive side. This made Kolulu eliminate herself from the batle to become king, but because she couldn't burn her own book, so she had Zatch and Kiyo to do it for her, thus sending Kolulu back to the Mamodo World. The above description came from Kyle Wright, and was edited by yours truly (contact me).